I'm now at Joburg airport on my way back to Cape Town, so this will probably be my last post until I next gallavant (or even go) somewhere else. I have now established the true reason that Americans gathered in Boston and dumped huge quantities into the harbour. Don't be fooled by the history books. The real reason is that the tea in Boston is really awful. I had about four cups of tea while I was there (two in the hostel and two different brands in the convention centre), and not one of them measured up to the tea I got on SAA coming home. One of them I didn't even finish. When airline tea is a step up, you know you have a problem. So I am now looking forward to getting home before I fall asleep and my face hits the keasdynboaerthsadw. So, having complained about limited freebies in the last post, I'm now the proud owner of, not one, not two, but three OpenGL T-Shirts. This was as a result of trivia questions (about OpenGL) thrown in during the OpenGL meeting at SIGGRAPH. I've developed an OpenGL debugger, during which I've had to look through some of the more arcane and bizarre parts of OpenGL, and finally it was good for something! I also gave my presentation this morning, which went fairly well. There isn't too much to say about that, but I guess no news is good news. Yes, that's right. 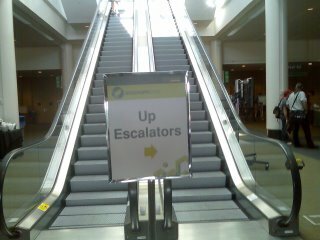 Not only do both escalators go down only, but somebody has addressed the problem by setting up a honking big sign to tell you that yes, this is a known bug, and the workaround is to go over to the other side of the building, take an up escalator, then come back again on the upper floor. There is no coke, only pepsi, which doesn't seem to have the same sugar content. It is in fact quite expensive - $2.75 for a small bottle of pepsi. Yesterday I bought a similarly-sized bottle of coke at a convenience store for $1.29, but today I forgot. Papers-wise, possible the most informative paper I've seen today was discussing the architecture of DirectX 10. While it isn't OpenGL, it will direct what graphics hardware will do and thus eventually what OpenGL will do. The big new thing is the Geometry Shader, which operates on primitives rather than vertices. It also allows you to do geometry amplification, such as tesselation, extrusion or shadow volume creation. Another cool feature is constant buffers, which make it easier to switch shader constants at various levels (true constant, frame, object, bone etc). The exhibition has also started today. I was led to believe that it would be wall-to-wall freebies, but was quite disappointed. I was really hoping to get a free backpack, since the straps on the one I'm using are held on by a few threads. However, I learned some interesting things at the NVIDIA booth. In particular, the GPU performance counters will very soon be available from a library under Linux, which will mean that I can get performance information about my thesis app without trying to fix the fact that it crashes under Windows. Right, I'm off to buy a copy of the proceedings, then head back and hope that the weight of the proceedings doesn't cause my bag to finish disintegrating.